This move is often part of the micro Chinese opening. 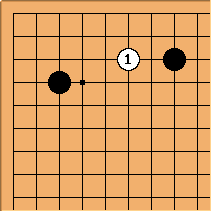 If White wants to play here, at a looks to be a good idea (compared to b, anyway: see 3-4 point low approach two-space low pincer tenuki for that). The reason is that according to the missing pincer page, the black stone on the side won't be as well placed. 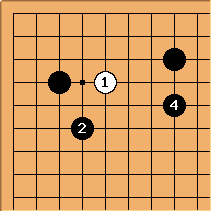 This occurred (with White 3 tenuki) in a 1942 Oteai game Sekiyama Riichi-Takagawa Kaku; giving us therefore by transposition a missing pincer tenuki variation. 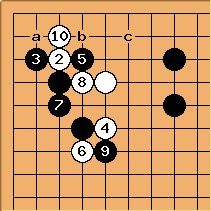 White had trouble making sabaki here (Black a, White b, Black c followed). This was Sekiyama at the height of his powers. White could also try invading at (see this position at 3-4 point distant low approach, one-space low pincer, tenuki). This has been tried by Qian Yuping. This position can also be recognised, from 3-4 point distant high approach, one-space low pincer, tenuki.